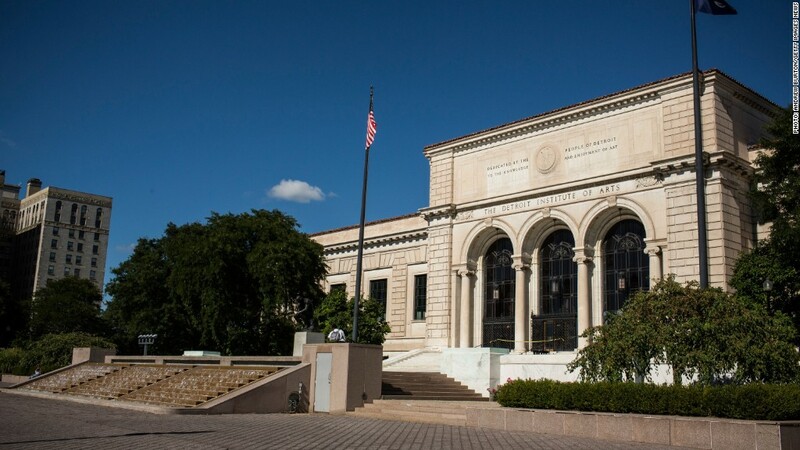 The Detroit Institute of Arts' collection is owned by the city and could be part of the bankruptcy. The "Big Three" automakers are joining a bid that could help save Detroit's extensive art collection. Ford, General Motors and Chrysler will donate a combined $26 million as part of a so-called grand bargain that would keep the Detroit Institute of Arts off the auction block, the Institute said Monday. The grand bargain, an effort by the city, state and other groups to raise $800 million, is central to the city's plan to emerge from bankruptcy later this year. It would pay creditors part of what they are owed and help protect pension benefits for retired city employees. Related: Who is hit most by Detroit pension cuts? The art, which includes a Vincent van Gogh self portrait worth up to $150 million, is owned by the city. If the groups are unsuccessful in raising the money, Detroit could be ordered to sell the collection by the bankruptcy judge. But if the grand bargain is successful, the Institute's art would be moved into a non-profit trust. Christie's auction house was hired by the city bankruptcy administrator to review the collection and in 2013 valued it at between $452 million and $866 million. The Detroit Institute of Arts is itself responsible for raising $100 million of the $800 million total. Among other contributions to the total is $200 million recently raised from Michigan state funds. Institute board chairman Eugene A. Gargaro Jr. said the automakers' contribution will "provide the additional momentum and excitement necessary for the DIA to satisfy its $100 million grand bargain pledge." Forda (F)nd General Motorswi (GM)ll each contribute $10 million, the Institute said, and Chrysler will chip in $6 million. Half of the GM contribution will come from its foundation. These are the first major corporate donations. Museum officials originally asked each automaker to give $25 million, a source told CNNMoney in mid-May. Detroit, once known as the auto capital of the world, is now infamously known as, the largest municipal bankruptcy in U.S. history. Currently it is home to just two auto factories: a GM plant and a Chrysler plant.